Happy Monday, sweet friends! The holiday season is in full swing, and I couldn’t be happier! It has been so much fun decorating my house for the holidays. This time of year is perfect for making special memories and remembering old ones. In addition to showing you my dining room decorated for the season, I have a couple of new additions to share with you. Moving to a new home can create storage issues. A recent purchase happily solved three storage dilemmas. You may remember that a French Country furniture piece was previously used as a buffet in the dining room. Now, it is in the master bedroom and is the perfect place to perch the television upon. Further, it provides extra storage for clothing. Replacing the existing dining room piece is a new cabinet and hutch. Recently, Mr. Bleu and I were at a local consignment shop looking for a chest of drawers. When we opened the door, this beautiful cabinet and hutch stared us straight in the eyes. Mr. Bleu, with his always helpful ideas, suggested that this would solve three storage problems. The present piece could be moved to the bedroom, dishes stored in an extra pantry could be moved to the new cabinet, and the extra pantry would create more storage for food items. It was a perfect solution! The cabinet is black with a distressed patina to give it an aged over time look. For the holidays, I tucked pine branches, magnolia leaves, red magnolias, pinecones, and ribbon to create a pretty and festive look. I love to decorate with items from nature. Frosted pinecones fill a Limoges bowl. I repeated the look on the antique china cabinet on the opposite side of the room. Another change to the dining room were these lace cafe curtains. Previously, I purchased inexpensive pinch pleat cafe curtains, but they just weren’t the look I was going for. I wanted pinch pleats but with a scallop in between the pleats. Therefore, I found some pretty lace and had these curtains custom made. They still need to be hemmed, but we are letting them hang just a little longer before making the final hem….just in case they stretch a little more. Below is my dining room centerpiece. I chose to set an Luminara Lantern inside a magnolia wreath embellished with loops of ribbon. Flameless candles placed upon gold pillars tied with red ribbon flank each side of the centerpiece. My favorite gold angels finish the ensemble. I am so happy that you stopped by for a visit. This week you are in for a special treat. 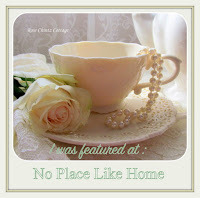 The sweet Chloe at Celebrate and Decorate is hosting a Holiday Home Tour Blog Hop. A schedule is posted below. My day is Wednesday, and I can’t wait to show you my living room decorated for Christmas. I hope that you have a wonderful day filled with lots of joy!!! Shannon, your dining room is stunning! The new hutch is so perfect for your beautiful blue and white collection. The addition of greenery, pine cones, and magnolia makes a lovely Christmas display! I can’t wait to see your living room all decked out sweet friend! Thank you, sweet friend! I hope you have a wonderful weekend! You china hutch is so gorgeous. You are lucky to be able to accommodate such a large piece. It is perfect for showcases all your beautiful blue transferware. And I love the Christmas touches of red. Thank you, Lisa! I wasn’t able to accommodate such a large piece at my old house. I am so thankful to be able to now, because I have way too many dishes! I hope that you have a wonderful weekend!!! It looks absolutely perfect Shannon! Your Mr. B has quite an eye, and good ideas!! The way you have styled it with pine and red with your blue and white is so you and so Christmas wonderful! Your centerpiece looks lovely too, I look forward to more on Wednesday! Thank you, Jenna! I hope that you have a happy weekend!!! No doubt about it: ample storage space remains high at the top of my “Gotta Do Something About This” list!!! Looks like you found the perfect solutions! That black painted cabinet is SLICK!!!!!!!!!!!! Thank you, Alycia! I hope that you have a happy weekend!!! Wow, this cabinet is beautiful and I love the way you styled it. I’m looking forward to how you’ll decorate it going forward. Thank you for sharing with us this week at Celebrate Your Story and we hope you will join us again next week. Thank you, sweet friend! Enjoy your weekend!!! Your dining room is gorgeous! I love your new cabinet and hutch too. Just perfect for displaying your pretty dishes. I sm sll sbout blue and white also. Lovely lace curtsin too. Thank you, Sheila, for the sweet comment! Enjoy your weekend!!! Oh I love that hutch Shannon!…Just the perfect piece for your room….beautiful with great storage…a great combination! Congrats on finding such a wonderful piece! Love your dining room so wonderfully decorated for Christmas! !